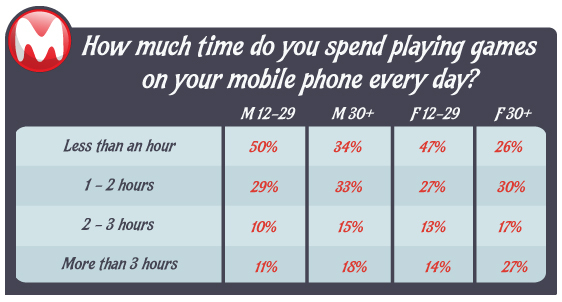 Mobile gaming falls somewhere between great time waster and rising addiction, and the obsession seems to be taking hold with women more than men, according to a new user survey by mobile social network MocoSpace. The company, which says it has the largest mobile gaming community, surveyed 15,000 of its users in December and found that 26.7 percent of women respondents age 30 and over played mobile games more than three hours a day, compared to 18.5 percent of men in the same age group. Overall, women said they played mobile games more than their male counterparts. Nine out of 10 women (90.4 percent) 30 and older said they played mobile games and 77.7 percent of females 12-29 said they played mobile games. Meanwhile, 82.8 percent of men 30 and above said they played mobile games and 72.9 percent of younger men said they did as well. Now, these numbers might seem high and could reflect MocoSpace’s user base, which is inclined to play games through MocoSpace and other channels. Also, MocoSpace’s users said they are heavily reliant on Android (s goog) as their preferred platform, well ahead of the iPhone (s aapl). But the numbers support other findings that suggest that women are some serious video game players. 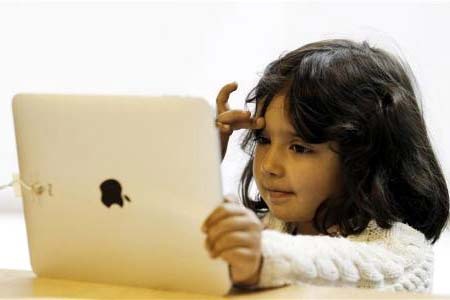 Flurry last year said that 53 percent of mobile social gamers are women, with a great density in women 18-49. The increase appears to be more recent for women gamers. When asked how much they play now compared to the previous year, 58.5 percent of women 30+ and 44.9 percent of females 12-29 said they played more compared to 44.1 percent of men 30 and over and 36 percent of younger men who said the same. Only 12 percent of women 30 and over said they played less. Overall, MocoSpace found mobile gaming is rising compared to console and PC gaming. Almost half of respondents (46 percent) said they played more mobile games now compared to the previous year compared to 26 percent for console games and 23 percent for PC games. The data, if representative across the mobile spectrum, shows that mobile gaming is a huge opportunity that is not limited to one gender or another. In fact, just like casual and social gaming, women are very much at the head of the mobile gaming market. Developers and publishers should consider how to broaden their portfolios to ensure they have games that appeal across the spectrum.